“Really, what is the point of doing what has already been done? We’ll leave that to the other folks. The joyful exuberance with which they approach their art is palpable and they clearly do this because they love it, and that is reason enough. The chemistry between the trio just drips out of every song, a classic example of a group of musicians who were lucky enough to find each other, and smart enough to realise it, their long experience of playing together in wide-ranging settings teaching them how to perform as the tightest of units, executing the hairpin bends and sideways drifts with aplomb. An example of the willingness to take on just about anything that works are the three brief versions of That’s the Way That You Do It scattered across Hard Chargin’; the My Way take is gruff and punky with driving rhythms and aching guitar solos, the Your Way take is pure Olde Tyme country with twangy guitars and yippee-ki-yay whoopin’ (but they can’t help but throw in a bit of spaciness to flavour the stew), Our Way, on the other hand, is a more upbeat and straight ahead high energy take, closing the album to underline what Dreadnaught is all about. 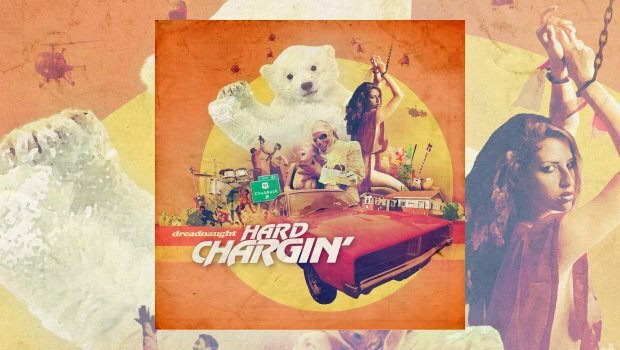 These reused themes help to keep the listener on track throughout the hail storm of genres that assault them throughout Hard Chargin’, all delivered with a huge dose of good natured humour. If I was ever going to make an album my new favourite title is ‘Obscured By Clowns’! The music keeps the laid back vibe of the wide open spaces whilst giving it a driving quality that should really be at odds but isn’t. The instrumental Gaudy Baubles is a thing of immense quirky charm, ‘falling down the stairs’ organ accompanied by strident guitar, spidery upright piano and uplifting flute, the piece opens out into widescreen prog with a steely heart. Compact compositional skills add punch to pieces that could ramble aimlessly, but you know you’re in safe hands with these guys. The first of the three lengthier pieces, Taking A Ride With the Fat Man (Fatta Fatta Puck Puck) jumps around a lot, again deploying beautifully epic sections to hold it all together amid the eclectic; there’s some lovely organ work from Justin Walton and bizarre pig-like noises to start, jazzy bits, drum solos, avant improv, funk – you name it, the trio working together in perfect harmony, even if the sounds are anything but as the band enjoy dropping discordant parts in where they aren’t expected. You really don’t know what’s coming next, which I really enjoy, and Bo-Leg-Ba has a Zappa-like jerkiness to the guitar parts while the electric piano hints at Steely Dan, but the whole is anything but derivative. Similarly obtuse, Express Delight mixes radio static, chamber jazz, sweeping Mellotron and ‘out there’ experimentalism even before the ‘tune’ begins, a fabulous jazzy thing of driving rhythms, lugubrious sax and piano shards that warps into a power trio stomp. From there it takes in a number of other vistas to a satisfying conclusion. Lovely stuff. The same goes for longest track Mummies Of The Cobbosseecontee. From Rick Habib’s stick snapping intro, piano and electronics lead into a Zappa-esque funk to which jazzy guitar and squelchy rhythms are added. Tempos flex with injections of power as the expansiveness of the piece unravels. It’s fiddly, frolicksome, varied and fun. The playing throughout is fizzing and bright, with a wonderful tone from Bob Lord’s bass. The eclecticism does not overshadow the need to include melodies and the whole is a ragingly adventurous work by players with the chops to back up their ambitions. The saxophone led skronk of Gets the Grease leads into the spidery intro to Slave Girls, spinning off into Primus-like weirdness with balls of steel. There’s space for some lovely additions from piano and organ as again the sound rises to epic proportions, only to be returned to front porch homeliness by the violin solo and a twangy guitar. 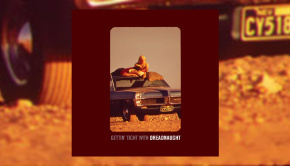 Tricksy without being difficult, Hard Chargin’ carries things forward from 2015’s Gettin’ Tight With Dreadnaught EP and anybody who already enjoy what the band do is sure to love it. For those unfamiliar with Dreadnaught, this is a fine place to start. Stow your preconceptions at the door and just enjoy the harebrained experimentalism of it all, marvel at the turn-on-a-sixpence musicianship and applaud the fact that self-serving showing off never enters into it. Another winner from a highly skilled and talented bunch of musicians who just go about doing they’re own thing, making the world just that little bit happier in the process.